In Tolland, Massachusetts there is summer camp called Camp Kinderland, in which looking at images from years past, seems to be a normal summer camp with kids singing, playing, boating, playing Frisbee, you know, the normal activities one generally associates with summer camps for children..... but this is no normal camp. This specific camp as been dubbed #commiecamp by film director Katie Halper. A social justice theme camp that admits on their about page that they "integrate progressive values with arts, recreation, and activism," with a "commitment to economic, racial, and social justice." If creating a whole new generation of communists by indoctrinating them into "progressive" ideology is slightly disturbing, what should truly concern everyone, other than Democratic socialists, is the type of "activism" these children are being taught as part of their activities. 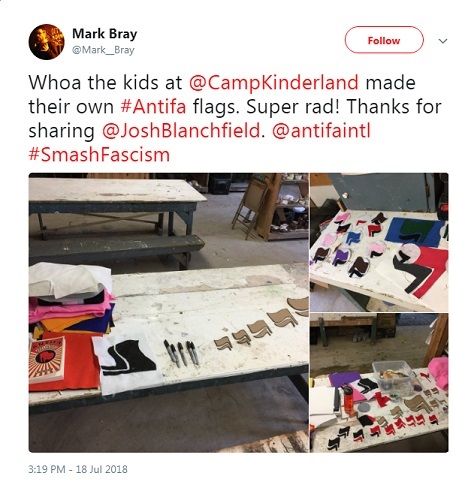 Such as having these children create Antifa flags, as proudly touted by Mark Bray, a lecturer at Dartmouth College and an Occupy Wall Street organizer, and the author of the Anti-Fascist handbook, where he boasted on July 18, 2018, "Whoa the kids at @CampKinderland made their own #Antifa flags. Super rad!" He even shared the images of the activity the little kiddie commies were participating in. A look at the image on the left, towards the bottom, you will see that at this kiddie commie camp, is a copy of Bray's Anti-Fascist handbook. Bray spends most of his time tracing the history of the movement, but finally gets to the heart of the matter, and the argument isn’t hard to follow. In essence: tolerance and reason don’t work, and you don’t wait for a small problem to get bigger, so let’s start beating heads. There are obvious objections to this. And though Bray struggles mightily to overcome them, he’s simply not up to it. Of course, no one is. But as a result of this close-minded thinking, we’ve got a violent movement convinced it has the right to be judge, jury and executioner because it has identified a deserving enemy. Now even if this worked in theory, we already know it doesn’t work in practice. Because the guardians of goodness who fill Antifa’s ranks don’t just shout down neo-Nazis and other racists who deserve total condemnation (but not the loss of their constitutional rights). They also disrupt and commit violence at mainstream Republicans rallies, and attack anyone they’ve deemed unacceptable. In other words, Antifa gets to decide who the fascists are, and don’t look now, but it’s you. Mind you, Bray does attempt to explain what fascism looks like. Its hallmarks include a preoccupation with victimhood, a cult of purity, abandonment of liberty and redemptive violence. I know, you’re ahead of me – that sounds like the Antifa movement. But they can’t be fascist because ... Bray says they can’t. Fascists can only be the people who don’t share the left’s views on race, gender and immigration (their views at present, that is – not necessarily what they believed a generation or two ago). Something else revealed back in September 2017, by Politico, is that the FBI and DHS officials "have been warning state and local officials since early 2016 that leftist extremists known as 'antifa' had become increasingly confrontational and dangerous, so much so that the Department of Homeland Security formally classified their activities as "domestic terrorist violence." The images from week three from 2018 on Kinderland's website, shows the activism and indoctrination to Democratic socialist policies do not end with making Antifa flags, but include signage and cakes with "Black Lives Matter/Ferguson" written on them, and signs that say "Raise Our Pay $15." 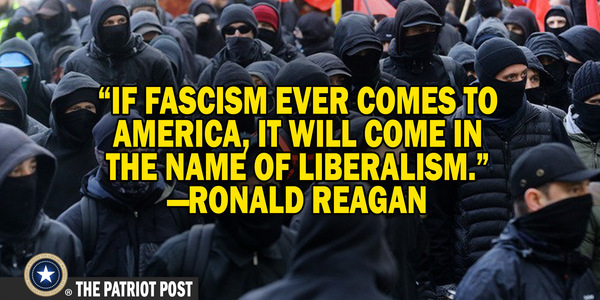 Those are issues and groups generally associated with progressive Democrats, or radical liberals, as is the case of those supporting Antifa and BLM, both groups who have become synonymous with violence as part of their protests. An important thing for moderate Democrats to understand is that these radical leftists are no long the "fringe" of the Democratic party, but have become mainstream for the party as a whole. This is evidenced by a number of recent and prior events, such as Democratic Representative Keith Ellison, who is also the Deputy Chair of the Democratic National Committee since 2017, proudly posing with a copy of the Anti-Fascist handbook, then posting that image to his Twitter followers. Other examples of the direction the Democratic party is barreling toward include the rise of the self-identified member of the Democratic Socialists of America, Alexandria Ocasio-Cortez, who promotes the "Abolish ICE," movement, demanding free college for everyone, medicare for all, among other socialist policies, being called the "Future" of the Democratic party, by none other than the chairman of the DNC, Tom Perez. Democratic leadership and congressional members have recently defended the violent MS-13 gangs, labeled border agents Nazis and encouraged mob harassment of Trump administration officials in public. We have documented most of the examples above previously, so the point here is that the radicalism being seen present day within the Democratic party, are not coming from the fringe of the left, but from the top leadership and politicians of the mainstream Democratic party. 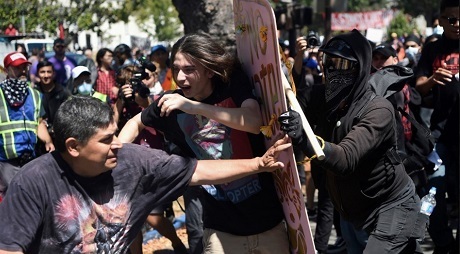 The future of the Democratic party lies in the radicalization of a new generation of children, indoctrinated at college campuses, and now at summer camps like Kinderland, where Antifa's violent tactics are celebrated rather than condemned. The Republican party may have their own set of issues, but at least mainstream Republicans will condem white supremacists, will denounce violence as a means to suppress the opinions of others, and will even call out members of the same party when they become as unhinged as Democrats are becoming. I used to separate Democrats from liberals, thinking Democrats simply held a different ideology, while the liberal faction of their party was becoming more and more radical, but now we have mainstream establishment Democrats, career politicians and the leaders of the DNC, promoting the most radical of positions and violent groups like Antifa, while supporting actual socialists. Radicalism is not the "fringe" left anymore, it is now the mainstream Democratic normal, which may be the top reason for moderate Democrats, horrified at what their party has become... to simply join the #WalkAway movement. The woman below did just that, because of the extreme violence she saw being perpetuated by her own party, the Democrats.